When does prospecting become stalking? I have highlighted in the past what I see as the glaring inefficiency of the real estate process. How fully two thirds of agents time is spent prospecting for business. How this entails the time-honoured but seemingly out-of-date processes such as door-to-door selling, mailbox flyers and newspaper adverts. So imagine my reaction when for the fourth time I get a flyer in my mailbox from the same local agent. A mailbox I should add that has a clear “No Junk Mail” sticker. It has driven me to ask the question, is this agent stalking me? It all started a month ago when the door bell rang one day and an agent greeted me on my doorstep to tell me who she was and the fact that she was new in the area. She naturally asked me if we were planning on selling. On being told no; she then went on to ask if I could recommend her to people I knew in the area! I was taken aback by this approach. I thought door-to-door selling went out with the advent of supermarkets, but to ask me if I could recommend her to other people! I thought afterwards how un-productive and potentially damaging this process is. With no track record of success in the area, knocking on doors to introduce yourself to my mind smacks of desperation. Anyway 2 days later I get a follow-up note again in my letter box – not personally addressed I should add; basically reiterating what she had told me and enclosing a fridge magnet - how original! A week or so ago – another flyer from this agent appeared, full of statements of the 'success of the company' she worked for – 'top company' here, 'award winning' there etc – it also featured a property she had sold – not a property remotely similar to mine nor even in the same suburb – another flyer destined for the bin. Yesterday I get a newsletter from the agent. Full of quotes from media article and economist quotes, the usual story of ‘great time to sell’, ‘loads of demand in the market’ and then a selection of property ‘on the market’ – not properties she is selling, just properties for sale. So as I said at the beginning I feel like this is tantamount to stalking. I have a clear message of ‘No Junk Mail’ on the letter box yet she (or someone on her behalf) keeps dumping these flyers in my box. Nothing in the content of them is in any way relevant and instead of endearing her to me, I am getting frustrated and will be going to go out of my way to avoid her. Now at this stage, I should stop and be constructive. Stop.........Pause and be constructive... OK! So here is my advice to her. If I was in her shoes this is what I would do? I would take a catchment area of say 100 homes across 4 streets within the area I would want to build my business. I would through access to the data of sales information from the likes of Terralink, Property IQ or REINZ which all agents have, collate all the data on these 100 properties. I would remove from this prospect list all properties that have sold in the past 12 months. I would also remove all properties that have not sold in the past 25 years. I would also remove all current rental properties. I recon this would give me around 35 homes. To these 35 homes I would develop a personalised letter addressed to the homeowner by name with their address. Far too many agents do un-personalised communication, which in today’s digital world makes a distinct and memorable impression. The letter would introduce myself and provide useful insight into the hyper-local market highlighting the immediate area around these 100 homes. I would present data showing the number of sales and how that has changed over the past 2 years. It would also show the range of prices and some of the properties – a quick walk around the area with a camera phone would be sufficient and give a consistency to the look of the photos. The letter would close out with a call-to-action of my availability for a no obligation chat to discuss the best approach to marketing your property if you would be interested in selling. In my mind doing the research to send such a letter to 35 homes might take 3 days work – but if I can gain 1 listing from that, it would be a good starting strike-rate, especially if the following week you target another 4 streets and another 100 homes. I am not advocating this approach as I feel the whole process of real estate needs reinventing but given the fact that the industry is slow to change, if I were to be a new agent this is what I would do and thereby avoid being judged to be a stalking agent! Now here is the thing!! 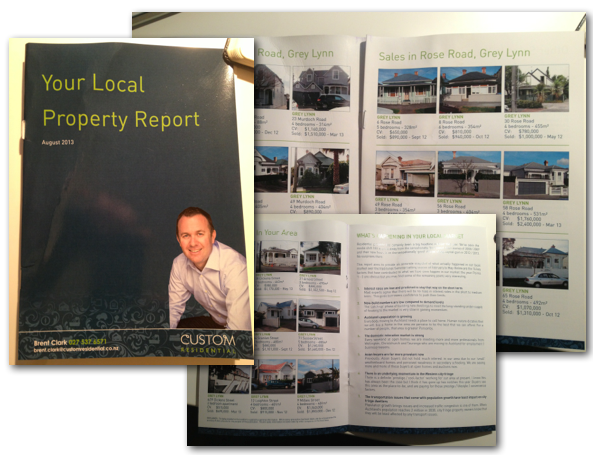 Having written this article I was stunned by the coincidence for through my letter box today I received a glossy 4 page brochure from another local agent – one I am happy to identify Brent Clarke at Custom Residential. Whilst not a personally address communication the content of the brochure is spot on and whilst I have no other assessment criteria beyond this brochure I would confidently state that I am at least 10 times more likely to call Brent than the other “stalker” agent, as well as way more likely to share Brent’s brochure with other people, whilst I unfortunately will not share anything but negative experiences for the other agent. Brent’s brochure engages me with what he describes as a ‘Local Property Report’ – something that lives up to the name as it provides a simple but compelling two pages of 9 properties per page for houses sold in the two streets that border our house – perfect hyper-local information. The brochure goes on to provide insight into what is happening in the local market with pertinent thoughts around population growth, transportation, interest rates as well as building consents. This is smart marketing – providing valuable insight, a demonstration of professional knowledge. Such a contrast to the desperation of door-knocking and endless flyers and of course, lets not forget that fridge magnet!